From the gym to the trails, join Kris Gethin on his journey to complete an IRONMAN. As a widely followed personal trainer and professional bodybuilder, Kris undoubtedly knows his way around the weight room. But as more of his peers became involved in endurance races, Kris became intrigued by the possibility of a new mental and physical challenge—did he have what it took to grind out an IRONMAN, without sacrificing his muscle mass? Thus began Kris’s mission to prove that all athletes will benefit from a combination of hybrid training, whether that be endurance athletes adding more strength training to their routine, or weightlifters incorporating cardio. He developed his 6-month training program as he went, integrating the insights of experts from multiple fields as well as the results from his own experiences. Kris put in the work to become a hybrid athlete—from fine-tuning his nutrition, preventing injury and refining technique, preparing his body to take the immense beating an IRONMAN presents, and developing the mental techniques necessary to stay focused and on course. Do you have what it takes to become a MAN of IRON? 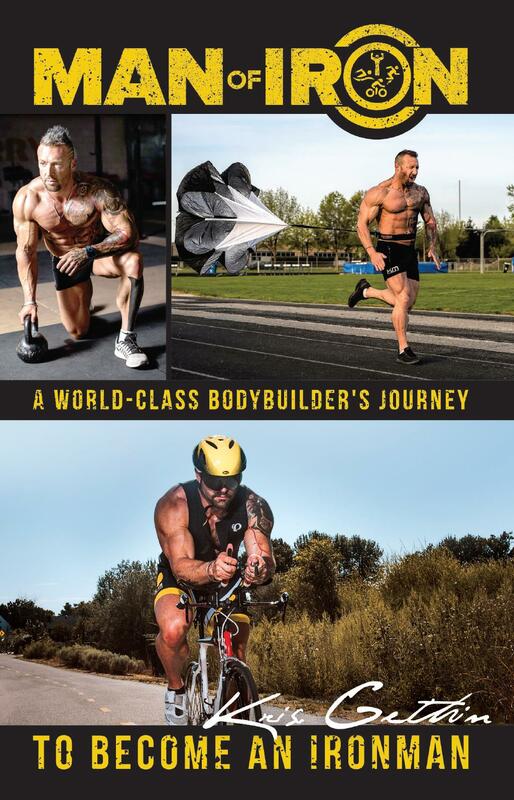 Kris Gethin is a world-renowned body-builder, IRONMAN finisher, ultra-marathoner, CEO of KAGED MUSCLE Supplements, co-founder of the Kris Gethin Gyms franchise, and celebrity personal trainer. He travels the globe hosting fitness seminars, workshops, exhibitions, and training the best of the best. Passing on his knowledge and techniques to his fans and followers, Kris has transformed millions of physiques through his video series you can find online. He is the author of numerous bestselling books, including Body by Design, The Adventures of KAGED MUSCLE, and The Transformer. Kris is also the founder of the DTP training method, former editor-in-chief for Bodybuilding.com and director of trainers for Physique Global. As the CEO of KAGED MUSCLE, Kris has elevated the brand to be the highest-rated and reviewed supplement company in the world. Kris is originally from Wales in the United Kingdom but currently resides in Boise, Idaho.